with more than 500 individuals banded in a single season of migration. MBO gratefully acknowledges funding from the Support Grant and Research Committees of Bird Protection Quebec, enabling us to provide full coverage of the Northern Saw-whet Owl season for the first time. Notes: The sixth full season of fall migration monitoring at McGill Bird Observatory has come to an end, and it was a memorable one indeed. Our final count of 6807 birds banded is nearly double our average over the past five years, and more than 1700 above our previous record of 5101 in 2008. 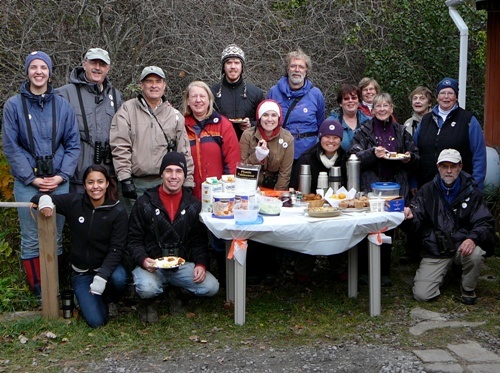 Even more impressively, over the past three months, MBO has banded more passerines than any other research station in Canada, including traditional front-runners such as Prince Edward Point and the tip of Long Point! Sincere thanks to all of our loyal and hard-working volunteers who contributed to our success over the past three months! As befits a season in which we set new records nearly every week, the 406 birds banded during our final week of fall was far ahead of the previous high of 351 established during this period last year. Although weather limited banding hours on a couple of mornings, we were still able to band at least 60 birds on all other days, showing that migration was still going strong, at least for a half dozen or so species. While we expect that some of these birds will still be on the move next week, we nonetheless wrapped up the season on October 30 as always, to allow for consistent comparison across years. At a glance, the Northern Cardinal above could almost pass for an adult, except for a bit of a dusky smudge remaining on the bill. 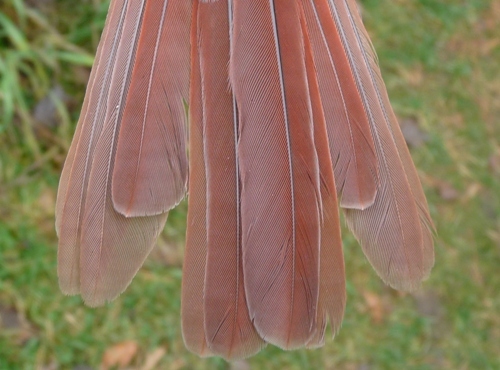 However, examination of the tail (below) shows a distinct molt limit between the broad and rounded basic rectrices that have been recently replaced (including r3 still growing) and the retained outermost three juvenile rectrices on either side that are browner, narrower, and more pointed. 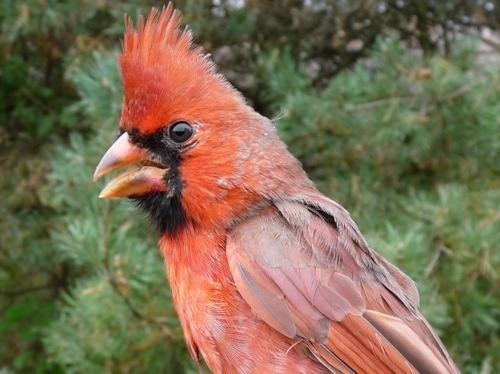 Within another few weeks, it would likely be impossible to tell this hatch-year bird apart from after-hatch-year cardinals. For much of this season, the number of species observed weekly was below average, but this final week of the season was a different matter, with 58 observed, matching our best ever count for this period, set in 2007. However, only two of those were new for this fall, Horned Lark (also new for the year) and Bohemian Waxwing, bringing the list for this fall to a final total of 140, still slightly below average. For the first time this fall we didn't band any new species this week, but we did have our first Brown Creeper repeat of the year. More interestingly were two new returns for this fall - a Red-winged Blackbird that is likely one of our local breeders but moved away in summer before returning as part of the large alte fall flocks, and a Slate-colored Junco, showing fidelity to MBO as either a migratory stopover or wintering site (if we happen to catch it again during our winter monitoring program we will be able to distinguish better among those two possibilities). American Robin remained in first place for a second week, with this week's strong movement bringing the season total to 394, another new record. 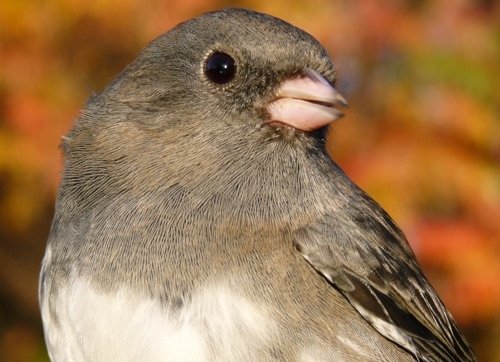 Black-capped Chickadee and Slate-colored Junco swapped positions from last week, but remained well ahead of all other species; again the top three dominated the week, this time representing 69% of all birds banded. Both of these species had already set record highs for fall as of week 11, and so just kept extending those this week, to 509 for the junco (previous record 361 last year) and 440 for the chickadee (previous record 222 in 2005. American Tree Sparrow jumped up into fourth place with a strong week 13 movement, similar to last year. Following them was an unusual three-way tie for fifth place, highlighted by the 22 Fox Sparrows, a single-week record for the species which, yes, contributed to another season record of 51, eclipsing last year's 32 by a wide margin. Rounding out the list were modest numbers of five other species, including two unusually late White-crowned Sparrows, one of which was our final bird of the 2010 fall season. This week's observations were remarkably similar to week 12, with the top seven species in identical position except for American Crow and European Starling swapping between fourth and fifth place. Even the average daily count of American Robins was within just a few individuals of the 552 observed last week. The top four species have been in the top five every year, so as in recent weeks, the pattern observed has been quite typical for this time of year. Juncos, chickadees, and White-throated Sparrow remained prominent in the bottom half of the top ten, as they have been the past couple of weeks. Mallard shifted up a couple of spots this week, while the only newcomer was Blue Jay in tenth place, displacing Common Grackle. As always, we will produce a detailed summary of the fall season, which will be available on the MBO website this winter. For now though we can present a few initial summaries. The 6802 birds banded this year is nearly double the average recorded over the previous five fall seasons, and the overall rate of 112.7 birds banded / 100 net hours is far ahead of our previous high of 91.0 in 2008. Like in 2008, the high season total was largely thanks to an inflated count of Yellow-rumped Warblers, but even without their contribution of 2361 individuals this fall, the total of 4441 other birds would still have been far above other years. In addition to Yellow-rumped Warbler, 23 other species were banded in record numbers this fall, including 10 other warblers, but just 2 sparrows. Our top ten species banded this season accounted for 75% of our total, and featured a mix of four warblers (Yellow-rumped, Magnolia, Nashville, and American Redstart), three sparrows (Slate-colored Junco, White-throated, and Song), and three others (Black-capped Chickadee, American Robin, and Ruby-crowned Kinglet). All of these species have appeared in the top ten for the season at least three times over the past five years, and half of them (Ruby-crowned Kinglet, American Robin, Magnolia Warbler, Song Sparrow and White-throated Sparrow) have made the list each year. There are now 9 species with over 1000 individuals banded at MBO since 2004, and another 40 species with over 100 individuals banded. A group breakfast was held at MBO on the final morning to recognize this fall's census team for their important contributions throughout the season. Pat helping with the breakfast preparations on the stove inside. 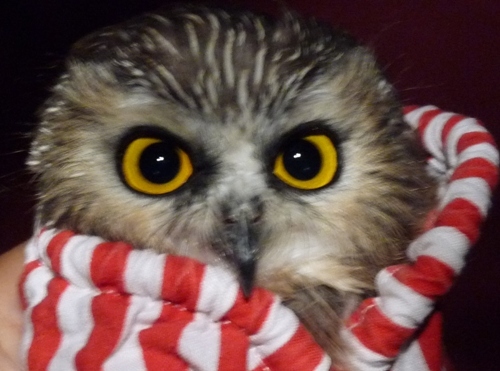 This was the fifth week of saw-whet owl banding this fall, and results were poor. 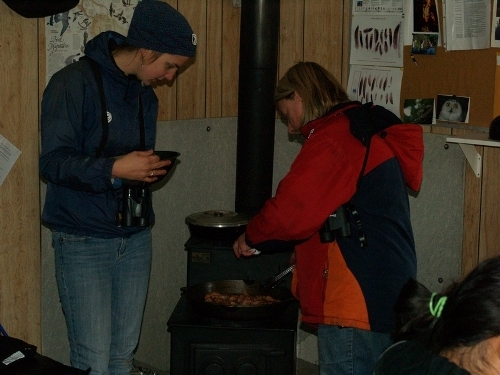 Four nights were lost to rain or snow, and over the three nights when weather did cooperate, only a single owl was banded. This brings the total for 2010 to 98. We plan to continue with full coverage for one more week, and will include notes on our results as part of the upcoming winter monitoring reports.